NFL quarterback selected in the second round of the 2014 NFL Draft by the New England Patriots after a standout collegiate career with the Eastern Illinois Panthers. 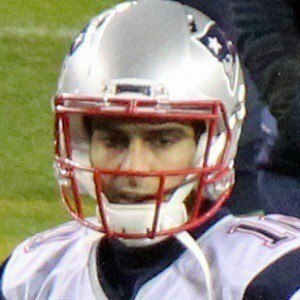 He won Super Bowls XLIX and LI with the Patriots, serving as a backup to Tom Brady. In 2017, he was traded to the San Francisco 49ers. He was born in Arlington Heights and attended Rolling Meadows High School in Illinois. He won the Walter Payton Award as the most outstanding player in FCS football in 2013. His parents are Denise and Tony Garoppolo. He began dating Alexandra Rose King in 2018. He and Pro Bowl quarterback Tony Romo were both star quarterbacks at Eastern Illinois University.